did not violate the Miami-Dade Fair Campaign Practices Ordinance because the statements are true. The Commission on Ethics found that these points were true twice in fact. First when retired Supreme Court Chief Justice Gerald Kogan found that these things were true in November 2014 and that there was no probable cause to admonish Garcia because if you say it and it's true, it's legal and ethical. Gonzalez did not like being called out on the truth and he objected so because he was crying, the Commission on Ethics agreed to a second detailed investigation which found the same. The Miami-Dade Commission on Ethics, led by Joe Centorino, who does not care much for honest and open government in North Bay Village, violated its own rules which clearly state that the probable cause determination shall be considered final and the Complaint may be made public at the time the Hearing Examiner makes the determination unless it is appealed. And then explains that the complainant (Gonzalez) has no right to an appeal. The new investigation brought no new facts to light, dragged on for five months at great expense to the taxpayers and concluded that every one of the statements made was backed by reliable sources including the Circuit Court, Recordings of North Bay Village Commission Meetings, the Florida Department of Revenue, the self same commission on ethics and other known purveyors of reliable information. So after the second finding of No Probable Cause, the Commission on Ethics today agreed to dismiss the complaint against Garcia for telling the truth about the Gonzalez. Gonzalez and his attorney did not attend the meeting this time, which is good since it really makes the CoE sad when Gonzalez cries. I have attached both findings and I urge you to read them. The second one is great writing. Below is the first finding from the former Chief Justice of Florida Gerald Kogan who finds the statements in the flier "valid".in a brief, to the point dismissal of the complaint. Then after Gonzalez went crying that it just wasn't fair, the CoE agreed to have a second investigation. Below is the second finding of No Probable Cause. This one is awesome, well written and explains clearly that there is simply no basis for the complaint in detail which apparently was what was needed. [in reference to this blog] It is clear that Mr. Vericker consistently criticizes Gonzalez on a whole host of issues...In large part, the posts criticize Gonzalez for his own statements and explanations. [in response to Gonzalez's supplying a handwritten note by his child] Gonzalez's reliance on this “evidence” is sadly misplaced. 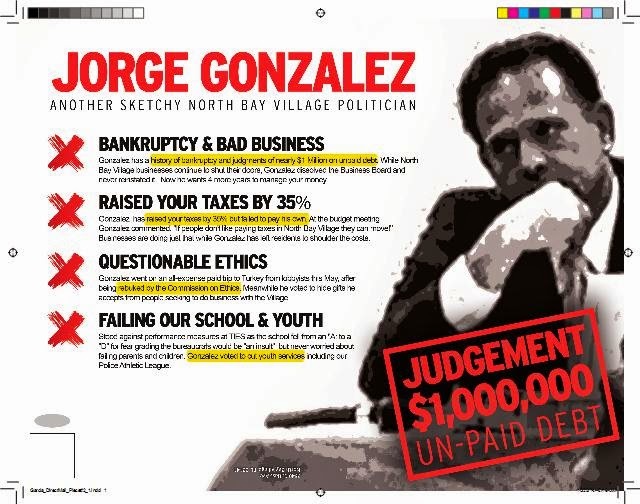 I am glad that the Commission on Ethics found what anyone paying attention in North Bay Village knows, that telling the truth about Jorge Gonzalez results in nasty, deceptive defenses and that this is finally behind Mario Garcia, who ran an honest and truthful campaign. Hey Commissioner Gonzalez, here's a test. Since the CoE has found the truthfulness of the statements about your record, your bankruptcy, your tax delinquencies, why don't you just resign? Why put yourself through this? Oh that's right, how else will you get tickets to the Heat and free trips to exotic locales? You know you've earned them with your votes.